A Bathing Ape (ア・ベイシング・エイプ) was founded by Nigo (Tomoaki Nagao) in 1993. Besides clothing stores, A Bathing Ape also runs businesses like a beauty salon, a gallery coffee shop and a record store. Born in Gunma Prefecture, Nigo initially worked as an editor for popeye magazine before opening his first store, called ‘Nowhere’ on April 1, 1993 in Harajuku, Tokyo. 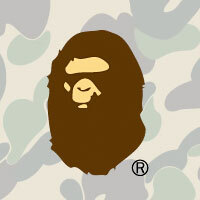 The inspiration for his brand name ‘A Bathing Ape’ comes from the movie ‘Planet of the Apes’ (1968) and a Japanese saying, ‘a bathing ape in lukewarm water,’ which is a reference to someone being spoiled. Nigo’s fame –‘confirmed’ by an exclusive CNN interview on February 28, 2006– started when the lead singer of the Japanese band Cornelius started wearing Bape shirts on stage. Although, A Bathing Ape is especially famous for its t-shirts, the company’s products include a wide range of fashion items from hoodies to footwear. Please send updated information on Bathing Ape. Thanks! how i find this band in thailand. why is it banned in Thailand ? how can i find the about bape? @vicky: I don’t understand what you mean. Please explain.